I see I’m very behind in journalcommenting but I got to get to the bank before they close so I will comment more later.. 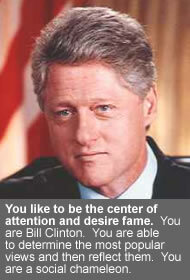 If I were going to be a u.s. prez, I think Bill Clinton would be a pretty accurate analogy. What would you want to do with me someday? I didn’t blow myself up, even. Well, for those of you who didn’t know, I’m doing lighting for a party on Saturday. This required me to get out my generator and test it, which in turn required convincing the EV to move. Since large subsystems were not installed in it, this sounded like a Big Job. Four hours of screw turning, and the main contactor closed with a delightful ‘CLUNK’. Backed it gingerly out of the driveway, then pulled out the genset. Crossed my fingers, said a few prayers to the gods of mechanicals, and flipped the switch to ‘on’. Fuel pump went ‘whhrrrr..rrr…rr..’. Flipped the switch to ‘start’. Crank..crank..crank… and then it roared to life. Wow. Guess it’s a pretty good generator. Stored for two years, starts in two cranks. Not bad. Settled right down to 60hz, too. However, having done all this work on the EV, I just had to know.. so I took it for a spin around the block. At first I was little-old-ladying it.. but then after a trip with no problems, I had to find out, so I mashed the pedal to the floor. WOoooOOOHOOOOOO! The batteries gave up their electrons quite merrily, and I was pressed back into the seat until the V/F fell off at about 5500 revs. P. came over last night, and we nuzzled and I felt rather more missing her than I have in ages.. she’s going to come stay for a week I think maybe.. I think she understands clearly what my problems with our relationship were, and that she doesn’t intend to repeat them. Or at least I hope. It was good to see her. Hope this doesn’t end in disaster..
Well, I shouldn’t still be up, but between duncan parking meters, new friends (I hope they’ll be my friends anyway) dropping by, and other misc things going on.. So far this one has 4 votes for ‘disturbing’. Tomorrow I’ll post about why I’m proud of this. I don’t see how anyone.. liberal, conservative, or otherwise, can vote for bush. I mean, we all know now – he lied to start a war. He ignored the largest protests in history. He’s signing away the bill of rights, he was friends with a man who stole millions from honest workers, his vice president owns stock in a company that makes electronic voting machines guaranteed to lose your vote (if you don’t vote for him ;-)). But it’s oh so important to stop the tax-and-spend liberals that if we have to vote for pure evil to do it, we will..
Wake up, republicans. There are times when the lesser of the two evils doesn’t belong to your party..
Well, the good news for all of you conservatives out there who keep saying ‘if you don’t like it, leave’.. if Bush gets re-elected, I will. The deal: You’re supposed to guess what song and band they’re from and post your answers as comments. Since I didn’t have a playlist loaded, I picked from recent and old favorites instead. Some of these are easy, some are quite tricky indeed..
1) I can feel it coming, days are getting longer, hearts are getting closer, love is getting stronger..
4) I dream of fire, Elaine.. Those dreams are tied to a horse that will never die..
6) Yah, the settlers laugh.. you won’t be laughing when your covered wagons crash..
8) But I don’t think it’s coincidence, and I don’t believe in accidents, it’s time to ask ourselves.. why are we still here? 9) I said the tragedy is how you’re going to spend the rest of your nights with the light on – so shine the light on all of your friends, well, it all amounts to nothing in the end..
11) Those creatures jumped the barracades, and are headed for the sea..
12) Hear my words taht I might teach you, take my arms that I might reach you..
13) I don’t even try to explain I just hold on tight and if it happens again I might move so slightly to the arms and the lips and the face of the human cannonball that I need to, I want to..
14) I blame you for the moonlit sky, and the dream that died with the eagle’s flight..
16) And I believe that we’ll conceive to make in hell for us a heaven a brave new world a promised land a fortitude of hearts and minds..
18) They have no mission, they have no passion But they dare to tell us what’s bad and what’s good! really long large file for broadband peeps only. Alex may cut a few of the better bits out in which case I’ll post them individually. And they have roxette, and toad the wet sprocket, and information society, and REM, and Madonna, and a little bit of Billy Joel, and .. I better get back to work. But this is cool – it’s what we should have built at onair..
1) Rollerblading around greenlake with P.
2) New breaks beatmeister came over, made some tasty beats as me and Tory threw down some other assorted audio. You are currently browsing the Never been one to let the carrier drop blog archives for May, 2004.